"Our menu offers a variety of appetizers, salads, sandwiches, entrees and desserts at great prices. Oh! 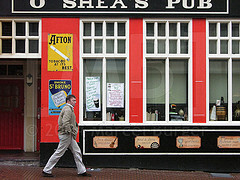 Shea's has two large bars, two dining rooms, two large flat screen plasma TVs for sports fans"